A healthy lifestyle doesn’t have to mean carving out two hours every morning for the gym or only eating fresh produce for lunch. The ideal healthy lifestyle is built up of small, healthy habits you do throughout the day. It’s no secret that you spend most of your waking hours at work. It makes sense, then, to start building up your small healthy habits while you work. 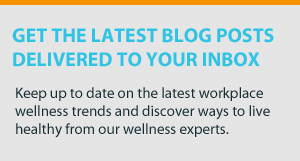 Here are some great healthy habits you can easily add to your workday. Unlike the big commitments like gym time or healthy cooking, these small habits can be worked into any schedule. There’s really no excuse not to try them out! Who knows? Maybe some will stick. And those habits can inspire your healthy lifestyle. Staying hydrated is one of the most basic ways to improve your physical health. Not only will choosing water over pop or energy drinks help you stay hydrated, but it will help you avoid the negative effects of unhealthy, sugar-loaded beverages. 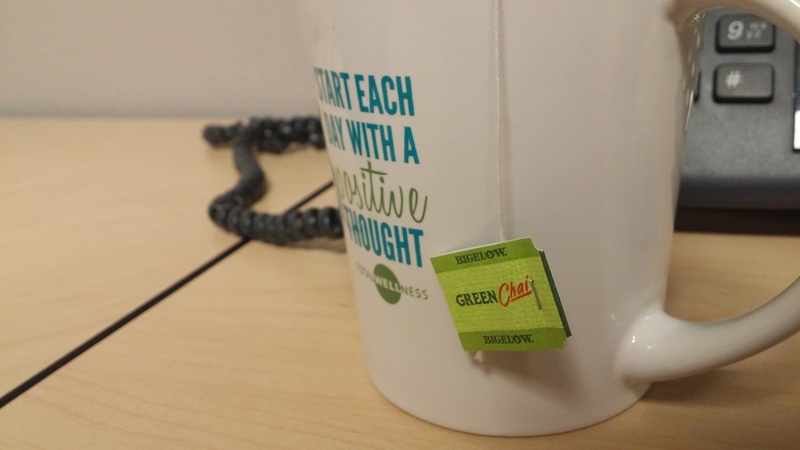 If you’re hooked on pop for the energy boost in the afternoon, consider switching to green tea. It has the same caffeinated punch, without all the added sugar! A cluttered desk can be super damaging to your mental health. How are you supposed to keep your thoughts organized if your desk is in complete disarray?! Take some time to clean up your desk and organize your time. Consider making to-do lists and prioritizing tasks so you can get all of those projects put away. Just because you don’t have time to hit the gym doesn’t mean you can’t be physically active. Try to work some physical activity into your workday by opting for the stairs over an elevator or escalator. Taking the stairs gets your muscles moving and can be a great aerobic exercise depending on how many flights you need to climb. You might be surprised how much showing gratitude to others can affect your own state of mind. Expressing gratitude not only improves your relationships with your coworkers, but it also greatly decreases stress and all of the physical health ailments that go along with a stressful lifestyle. There are ways to make your lunch healthier, even if you didn’t have time to pack a fresh lunch from home. One way is to skip added condiments like salt. Most Americans need to cut back on sodium, which can be found in high levels in restaurant foods and table salt. Eating lots of sodium can increase your blood pressure and put you at higher risk for heart disease and strokes. Some days, you just can’t bring a fresh lunch to work. Cut the salt to make your store-bought lunch just a bit healthier. There is no way to increase stress like working when you’re distracted. Be intentional about ridding your workspace of distractions so you can be productive and efficient. Maybe that means turning off email notifications or shutting down your cell phone. Whatever it means for you, take those steps to work in a distraction-free space. Positivity goes a long way for both your physical and mental health. Not only does it make the day more enjoyable, but being optimistic can reduce stress levels and improve resilience. It can be hard to force a positive attitude on a bad day, but it is incredibly easy to “fake it ‘til you make it.” In fact, the act of smiling—even when you’re not exactly happy—can bring about positive emotions and turn your mood around. You might think standing while you work is reserved for those who can afford a fancy standing desk. You are sorely mistaken. There are plenty of simple ways to make your own, temporary standing desk. You can find an empty cardboard box to set atop your desk surface. You can clear out an overhead shelf. You can even stack a pile of books as high as you need them. All you need here is a little creativity. Find something that reaches a comfortable height for you, set your computer on top of it, and get to work! Being healthy doesn’t have to include expensive and time consuming health behaviors. The most sustainable healthy lifestyles are built on small healthy habits that you can do every single day. These small habits can be the easiest, healthiest choices you ever make. Take the time to test out these eight excuse-free habits. Stick with or adapt the ones you love, and be sure to share them with your employees. Remember, there’s no excuse not to have a healthy workday! What other small, simple habits do you integrate for your healthy workday?